When SatStream was approached by Endemol to provide live streaming of several Manchester City football matches there was, of course, much excitement at the SatStream offices. This was however coupled with an acute realisation that it would have to be perfect so as not to disappoint the vast number of fans. Luckily the broadcast facility in London is well equipped for just such an occasion! Tucked in the foothills of the Blue Ridge Mountains near historic Charlottesville, Virginia, Horton Vineyards is an old-world Tudor winery where visitors can tour vineyards and underground stone cellars, attend events, and sample up to 40 kinds of wine. Its secluded location in Gordonsville, however, means that Horton Vineyards has no access to high-speed, landline Internet services. For five years the business struggled with a slow dial-up Internet connection for important daily tasks, such as credit card transactions, inventory maintenance, and email marketing. Finally, in 2003, owner Dennis Horton discovered HughesNet® satellite broadband service and decided to sign up because he simply couldnt take the delays and outages any longer. Speaking of wine, Vintners Own, where you create your own custom fine wine, is a small-lot barrel production facility located in Houston, Texas. A winery? In Texas? Absolutely! Given the gnashing of teeth surrounding the FY11 budget proposal for NASA, one could suspect that the tumult signals the winter of our despair in the space community. But that would be to color the entire global space enterprise based upon a single agency that accounts for only 7.2 percent of the action. The global space economy grew by about that much (7 percent) in 2009, with U.S. government spending up 11 percent and spending by other governments up 22 percent. Sometimes an ownership change involves a great many challenges, as well as re-identification of what has been purchased. Granted, there are still regulatory issues to confront, but the change of ownership for the former Koreasat-3 (also known as Mugungwha 3), so far, as been accomplished quite smoothly! 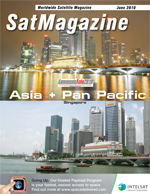 Many of the worlds biggest satellite companies will congregate at CommunicAsia and BroadcastAsia when the events return from June 15 to 18, 2010 to the Singapore Expo. These global players are eyeing the events as the choice business platform in Asia to help ramp up their presence and reach out to the regions resilient satellite markets. Jacob Keret is an experienced business and technical manager with extensive expertise in satellite communications. Prior to joining Starling, Jacob co-founded Spacecom Satellite Communication Services, service provider of Amos satellites, and served nine years as VP marketing and sales, building the company into a leading position in several European markets. Previously, he held the position of marketing manager in the MBT Division, Space Directorate of Israel Aircraft Industries. During his tenure, Jacob handled the successful negotiation with a European partner to launch a communication satellite. Earlier, as a space systems engineer in the same division, he was responsible for satellite trajectory planning and performance analysis. Jacob holds a B.Sc. in aeronautics and space engineering from the TechnionIsraeli Institute of Technology and an MBA from Tel Aviv University. SkyFile® Video is an enhanced software application that allows you to capture, compress, edit and transmit video files over IP satellite terminals, no matter your location. Easy to use and offering a variety of versatile features, including a video editing tool, SkyFile Video from Vizada delivers the ultimate in video transmission performance and reliability. The AMOS satellite constellation, operated by Spacecom, has, until quite recently, been focused on the growing markets of Central and Eastern Europe and the Middle East from its 4 degrees West orbital slot. This orbital position enables linking between the US East Coast and the Mediterranean Basin  this makes the AMOS brand a regional and international success. As one of the leading providers of products and services for high performance satellite-based communications networks, Gilat Satellite Networks Ltd. (Nasdaq: GILT) enables communications networks across the globe. Asia is a major market for Gilats VSAT (Very Small Aperture Terminal) solutions due to a plethora of business opportunities. SatLink Communication is a leading gateway to and from the Asian market for broadcasters, networks, cable groups and news groups. Strategically located in the Middle East, the global satellite communications services provider geographically straddles satellite orbits and world-wide fiber networks enabling it to offer services and platforms to and from Asia. The Asia-Pacific satellite market has experienced significant growth in recent years. The growth of digital pay TV, broadband applications and government communications remains strong  particularly in India, Australia, the Pacific Islands and East Asia. What does it take to get to space? Its very simple  lots of money and solid engineering. Sky Deutschland is Rupert Murdochs German pay-TV operation, sitting nicely alongside BSkyB and Sky Italia. Except that News Corps German operation has had a troubled history, with allegations of falsifying subs numbers, disappointing progress, and too high a churn of CEOs! Murdoch recently appointed Brian Sullivan as CEO and he is doing the rounds of the investment banking community  and the first impressions are wholly positive. Sullivan took over on March 31st from Mark Williams, although Sullivan has been shadowing Williams since the start of the year. With Satellite 2010 and NAB having come and gone, the industry is once again left in the wake of the buzz that always encircles these iconic events. During the show, exhibitors ceremoniously congregate and swap perspectives of its benefit (or lack thereof), pitting their personal ratings against those voiced by the professional market observers and disseminated for mass consumption. The metrics upon which they base their opinions about the trade show performance are generally limited to visual observations designed to answer the usual list of questions  How is the volume of this years traffic compared to years past? Are they quality customers or souvenir-seeking tire-kickers? Is the volume of attendees a direct indication of the health of the market? Do I have to go through this next year? Well, perhaps the last question fits into a different category, but I know its one that is commonly asked. Imagine youre a Brontosaurus with your face in a prehistoric tree top, munching on fresh leaves. Your relatives have ruled planet Earth for more than 150 million years. Huge and strong, you feel invincible. Well...  Youre Not! An IP wave surges through the Contribution, Distribution and DSNG landscape. Traditional tape-based workflows migrate towards new, cost effective IP-based workflows. How does the satellite segment fit in the migration process as an inherent part of the broadcasting network? A subsidiary of France Telecom/Orange, GlobeCast is a leading provider of media management and global content delivery services for broadcasters and content creators around the globe. With a secure fiber and satellite network connected to dozens of teleports, technical operations centers, and points-of-presence worldwide, GlobeCast manages and transports millions of hours of video and other rich media each year. Launched on August 21, 2009, in tandem with the JCSat-12 satellite via an Ariane 5 launch vehicle from Europes Spaceport in French Guiana, the Optus D3 satellite occupies an orbital slot at 156 degrees East and is co-located with Optus C1.